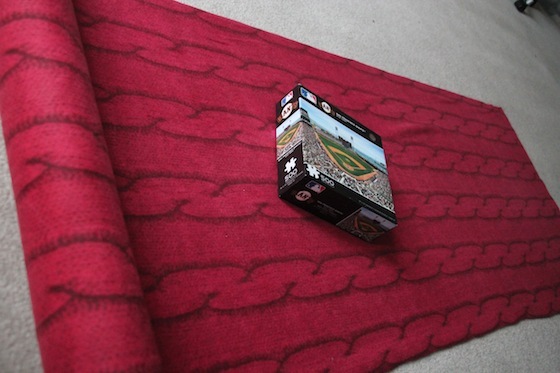 I recently purchased a Giants jigsaw puzzle (awesome) of AT&T Park, and wanted to open it. We don’t really do jigsaw puzzles, so when I thought about starting it, I realized if I wasn’t going to sit down and do the whole thing in a weekend, I’d need to either dedicate a space for the puzzle so it could stay undisturbed until I could complete it … or figure something else out. I remembered that they sell jigsaw puzzle mats where you build the puzzle on the mat and when you need to store it you just roll the whole thing up, and I thought about buying one of those … but like I said, we really don’t do jigsaw puzzles so I realized I didn’t want to spend money on a mat just for that. Aha! That’s just what I decided to do. Frugality FTW! I went online and found a few sites with DIY instructions, like this mat from “Organized Christmas”, but it still kinda seemed like a lot of trouble to go through for something I wasn’t sure I was going to use that often. The patterns I saw involved lots of sewing and cutting different pieces of fabric to make the mat all nice, with ties and other touches. They were using rotary cutters and cutting mats, hot glue guns, sewing machines … blech! That’s cool if you’re making the mat as a gift (most of them were), but I just needed to store a puzzle. Then I found this post from “SuperMom” about making a puzzle mat, and I loved it. All she did was cut some felt and rolled it around a mailing tube. I wanted to make mine a little nicer, but I liked the way she thought. My mom made these awesome scarves out of felt a while ago and had some leftovers (she scored some of the patterns on sale and bought large pieces), so I went down to her place and asked what her largest leftover piece was. She had several yards of this cute burgundy “cable knit” pattern. Great! The color is nice, and the pattern’s not too “busy” so it won’t interfere with the puzzle building! Plus, the lines on the fabric made it super easy to cut. I had an old mailing tube from a photograph I had enlarged (thanks, Zee & Ruel! ), and I just put the mailing tube I had on the fabric, saw where the cable pattern line matched up, and cut what I needed. Yay, no measuring or marking! This was awesome. The first DIY page I looked at had you wrap the felt around an old wrapping paper tube, pin the fabric, carefully remove the tube, then sew the “sleeve” for the tube and replace the tube into the sleeve. So much work! Plus, I didn’t really like the idea of using an old wrapping paper tube – it seemed too lightweight. What if I accidentally put my elbow on it and crushed it? The second DIY page uses a cardboard mailing tube, which I liked the idea of, and it doesn’t attach the tube to the fabric at all – but then that’s just a piece of felt and a mailing tube. I wanted to attach the tube to the felt somehow, but I also wanted the option to remove the tube. Wouldn’t it be horrible if the tube – it’s pretty heavy since it’s a mailing tube – fell off the edge of a table and took my puzzle along with it?! Velcro to the rescue! I cut four pieces of sticky-back Velcro, spaced them out, and while they were stuck together I placed them on the edge of the felt. Then I removed the paper from the other sticky back side, and rolled the tube and fabric so that the velcro stuck and closed the “sleeve” for my mailing tube. Yay! I was done! 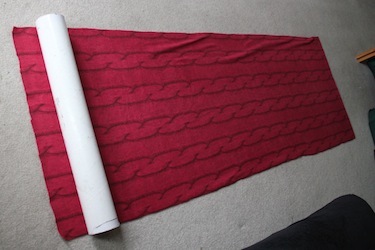 Well, kind of – I had to trim the raw edge off one side of my fabric before cutting it to the length of the mailing tube – I thought it would be kind of cool to reuse the strip, to tie the mat closed when I had it rolled up. I just cut the strip in half and the lengths were perfect! 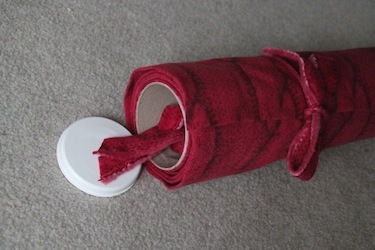 Plus – another bonus from using a mailing tube – I can store the strips inside when the mat’s open! I was really happy with the way this project came out. I got to reuse things that were around the house, I saved money by not having to go out and buy a jigsaw puzzle mat, and now I can work on my puzzle! All in all, pretty awesome. And I didn’t have to sew a stitch, either!